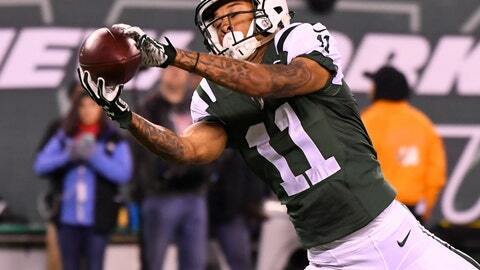 Wide receiver Robby Anderson proved to be a player on the rise in his rookie season. It’s still early in his career but he’s ready to take the next step in 2017 with the New York Jets. Last season with the New York Jets, wide receiver Robby Anderson had moments of brilliance on the football field. There was a great connection when he was able to play with quarterback Bryce Petty since both spent plenty of time together during preseason action and of course, in practice throughout the regular season. It was evident that Anderson developed a solid relationship with Petty and it showed. Last season, Anderson totaled 587 receiving yards, 42 receptions, and two touchdowns while showcasing his speed and solid route running. Plus it was also revealed in Allen’s article than Anderson plans to work with wide receiver Chad Johnson once again this offseason. The two worked together when he was getting ready to get drafted last year but ended up signing with the Jets as an undrafted free agent. Anderson has a good head on his shoulders which undoubtedly could mean the Jets found a real diamond in the rough. It’s hard to tell what kind of step he’ll take next season since the quarterback situation of the Jets has a huge question mark around it, but he should come back ready to push the envelope. With a bright future ahead, Anderson should hopefully turn out to be a real keeper over the years. Once he’s able to contribute more on the gridiron, there is no telling just how successful he’ll be in making the most out of his golden opportunity with the Jets.